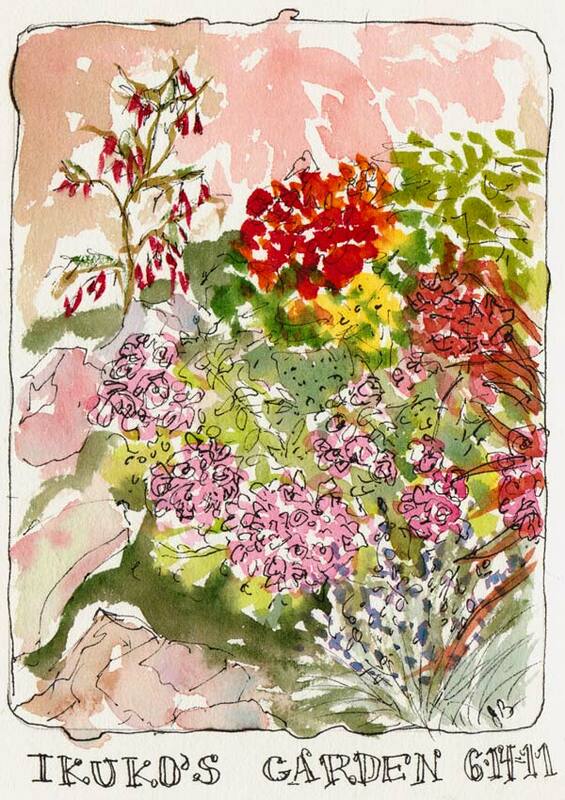 Ikuko's Garden, ink & watercolor, 7x5"
My friend Ikuko invited our Tuesday night sketching group to sketch in her lovely and lovingly tended garden. I picked a spot that was still in the last bit of sun and sat in a lawn chair to sketch and relax. For a change I tried to just be loose and free and it was really fun. 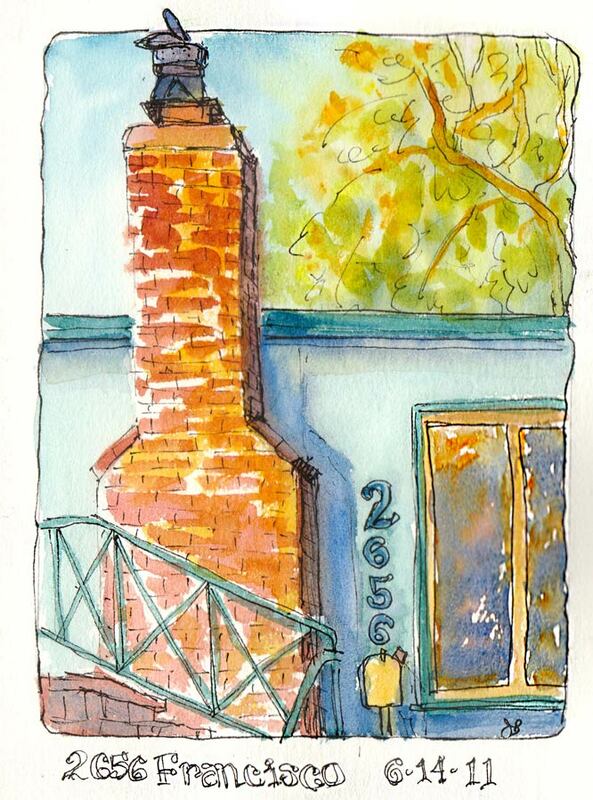 Ikuko's at Sunset, ink & watercolor, 7x5"
I was interested in all of the odd contraptions on top of her fireplace and the glowing light of the sunset on the bricks and the windows. I managed to fit almost everything I wanted on the page (with a little rearranging from real life; the mail box was below the frame but I liked it so stuck it in.) I was a little annoyed when I finished the sketch that I’d “messed up” the house numbers (the 2 is too big) but a week later, who cares! I love your plein aire watercolors. No one would notice the 2!!! These sketches are delightful! I didn’t notice the size of the 2. “a week later, who cares” is a profoundly important statement! It is a great thought to release oneself from the paralysis of perfection. Thank you for being so straightforward with the way you sketch! You’re an amazing artist 🙂 How do you do it ? I follow your blog since a little while and enjoy it a lot. I like both your watercolor and oil paintings; what draws my attention in your watercolors is the beauty of those not too perfect ink drawings; I have personnaly a very precise style (although not an artist by background, I recently started a blog where I post some pieces from time to time -you’re welcome to have a look), and your “free” way of drawing is perhaps something I should try to achieve for its lively spontaneity. I like your version of the conservatory of flowers; it reminds me the Grand Palais in Paris, I like those glass “duomos”. Your oil paintings are gorgeous; very lively and colorful. The lemons in your previous post are no exception. Thank you so much Jana for your kind words! For someone like me who has never taken any drawing or painting courses, this is realy cheering up. I’ll indeed try some free ink drawing when I get a chance, and perhaps try to color them freely in watercolors. Just a question of time; I’ll let you know when I make an attempt.